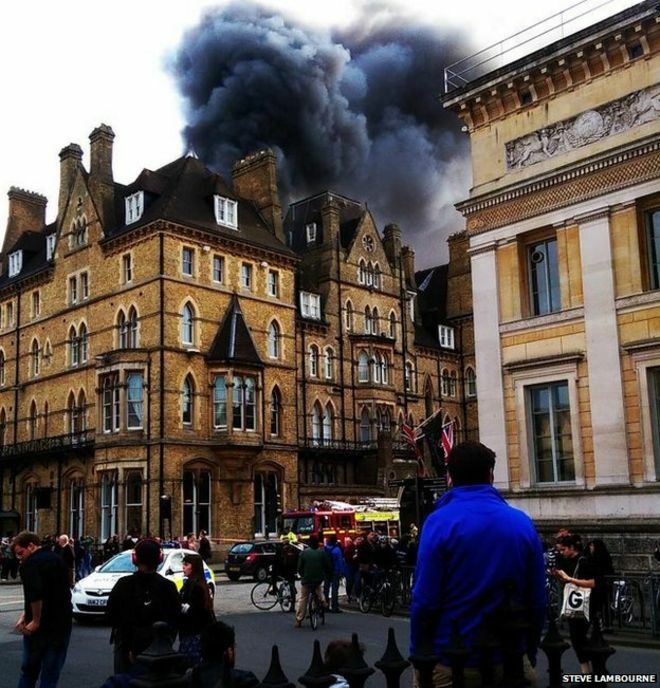 The five-star Randolph Hotel in the centre of Oxford has been damaged by fire. 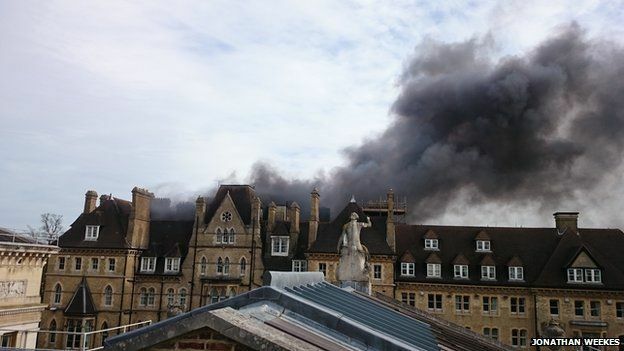 Thick black smoke could be seen coming from the 150-year-old gothic building on Beaumont Street, which caught fire at about 16:30 BST. The street has been closed both ways to allow firefighters and other emergency services access to the building. Anabel Bacon told the BBC smoke “came erupting out of the hotel”. Police said no casualties had been reported. 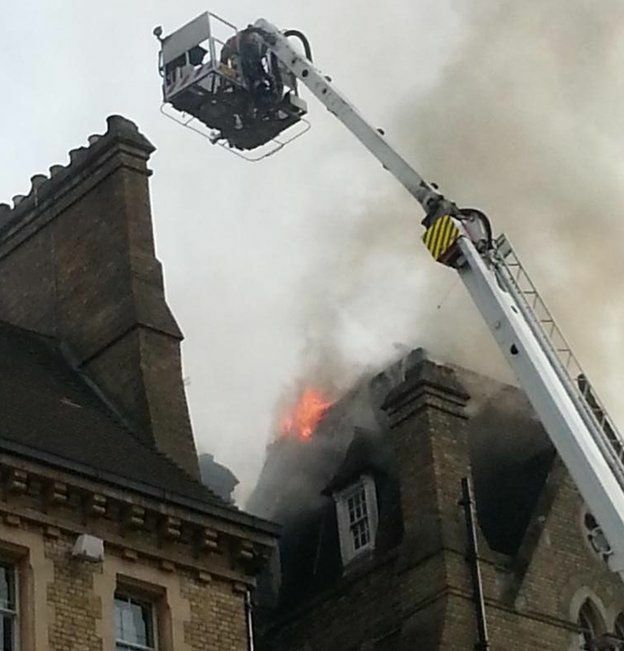 The fire service said the cause of the fire, which started on the ground floor and spread to another two, was unknown, but not thought to be suspicious. Fire crews will remain on the scene until the morning damping down, and the road will remain closed. Assistant chief fire officer Simon Furlong said: “It’s been a significant fire. At the moment there has been no lateral spread of fire through the building, so we’ve managed to protect that area inside. 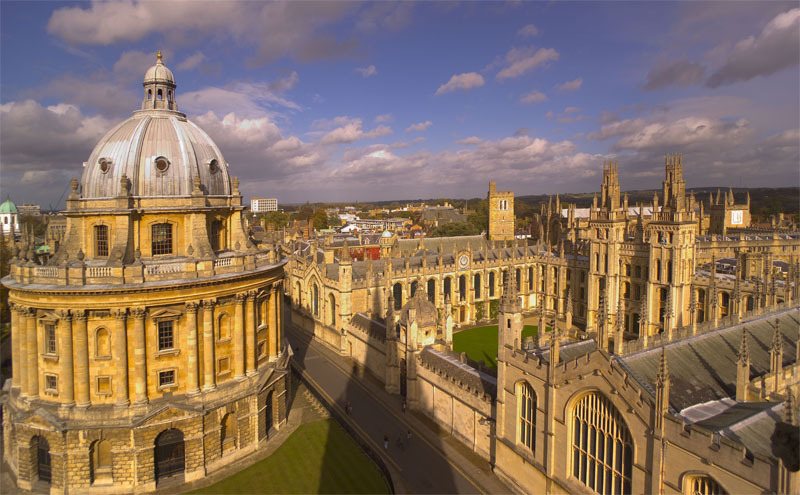 “This is iconic property within Oxfordshire so we’ve managed to protect that. “It’s been a good job by the firefighters and I’d also like to praise the hotel on their quick evacuation processes that saw in excess of 80 persons quickly removed from the building.”Ms Bacon, who was on the roof terrace of the Ashmolean Museum opposite the hotel, said the smoke “stopped very quickly so we thought it was over, and then all of a sudden it resumed again with just as much force”. “The fire service was there very quickly after the second plume erupted, within five minutes,” she said. 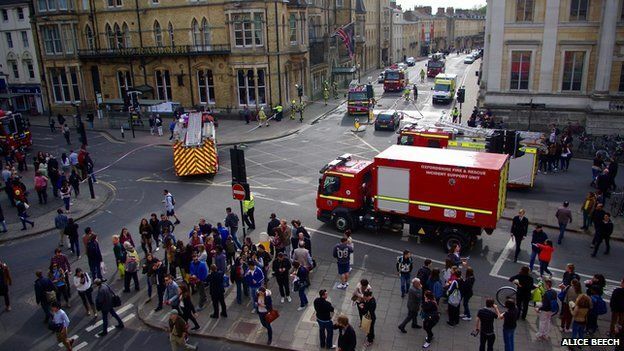 Tom Scott was driving past the hotel when he saw smoke burst from within. He said: “I turned into Beaumont Street from Worcester Street and you just couldn’t miss it. “It was a very thick ball of smoke. I parked up and told the porter what I could see. “Then another plume came out and he must have realised what was going on. He shouted to phone the fire brigade as soon as he saw it. Leo Wilkins was staying in the hotel with his wife and was among the guests forced to flee the building. “While walking down from the second floor I could smell smoke in the building,” he explained. “It’s not looking very good. I’m just hoping there’s no water damage in the upper bedrooms. “It’ll be nice to get the clothes that I’m going to wear to a wedding tomorrow.